Firstly I need to take a couple of minutes just to saviour the silence in my house. Does that sound bad? The kids went back to school today and my life becomes my own again. I am excited by the prospect of achieving so much during this school year. I miss the kids being around, but it is nice to get back to normality. I have great ambitions this year. No time for wallowing in self pity, or sitting idle. I am a woman on a mission. Here are my objectives for the year. 1) Organisation. I aim to be more organised this year. I want to plan my time and use it wisely. I need to be able to balance everything at once and not feel stressed. I know that I really need to learn to say 'NO' and actually be a bit selfish this year. I have plans that require me to be selfish, so I am not going to feel bad about it. 2) Move over Julia. I aim to cook more. My family are in desperate need of some new meal ideas and I would like to be one of those families where the children arrive home to the smell of chocolate chip cookies baking in the oven. I will blame Jamie Oliver and his new cooking series 'America' for this need. There are some seriously delicious recipes on it. 3) Move over JK Rowling (only joking on that one - I would kiss her feet if I met her). I aim to have a completed manuscript by the end of the school year. Ooh that is a big one and I have put it out there now. So if I haven't achieved this by next July, feel free to yell and holler at me. I don't care if I never get it published, but at least I will have put to rest that inkling feeling that this is what I am supposed to do with my life, a feeling that has followed me since childhood. I need to work on a lot of areas to improve my writing and I know I need to really look at my grammar. 4) Scrapping Queen. I aim to be more creative. I hope to make at least two scrap pages a week. Though I also want to make other things. I love to sew and have a fabulous cupcake cross stitch sitting in my cupboard. If I don't start it soon, it will be out of fashion. So they are the plans for this. Honestly feel free to shout at me, if I don't achieve them. What plans have you made this year? Back to the world of Monday Mailbox. I ordered these books a few weeks ago, so I am not going to feel bad about buying them and yes, I actually bought these ones brand new. However, I purchased them rather cheaply at £2 each. I have already read The Hunger Games, but it is one of those books I know I will read again and again. The Dead and The Gone is the second one by Susan Pfeiffer - I reviewed Life As We Knew over a week ago. Numbers was on my Friday Finds the other week. I also went to the bootsale last week and picked up these four little gems. The Tales of Beedle The Bard by J.K Rowling, another one I have already read, but just needed to have. The Wolves of Willoughby Chase by Joan Aiken - fabulous read. Holly's Inbox, which has recently travelled quickly around the book blogging world. A Spot of Bother by Mark Haddon, author of The Curious Incident of the Dog in the Night Time. I also received Best Intentions from Dar over at Peeking Between The Pages. I won it in a competition she ran recently. So a lighter load of books for me this week, though probably more than is seen as normal by non book loving people. What did you get? Good luck with your goals, Vivienne! Have you considered joining NaNoWriMo? It's in November, and basically people from all over the world devote the month to writing :D It would probably help a lot in terms of motivation to get that manuscript written! Ooh you expect this sort of post in January don't you? Got me thinking what I did promse myself in january though. Lose weight.. that did happen but due to side effects of the pill is all back on again so am concentrating on that at the moment, More time crafting - definitely kept to that but not as much as I would like, more home cooking (that was because of Jamie Olivers LAST book! *g*) Kind of kept to that but been naughty in recent months. Must get back on it. I said the exact same thing as you - I want my kids to wake up on a saturday morning to the smells I woke up to... rock cakes, jam buns, sausage rolls...Ummm, oh and live for the now rather than 'one day' as we never know whats round the corner. That one is harder to stick to but a lot of fun when we do. What type of manuscript do you think you'll be writing? Can't wait to see what you do. No book finds for me this week. I hope you achieve your goals:) The books sound great, so I will check them out. I received The Suspicions of Mr. Whicher. And here's me thinking New Year Resolutions only happened on December 31st. Good luck with yours. Jo - honestly just come and shout in my ear on a regular basis please. Blodeuedd - I didn't realise Holly's Inbox was funny. Looking forward to it all the more. Nymeth - I haven't heard about NaNoWriMo. It sounds like something I need to join. Carmen - if Jamie's last book did that much damage, I hate to think what the new one will do. Passionatebooklover - thank you. I have The Suspicion of Mr Whicher too and really need to read it. Petty Witter - I do everything backwards. Well, I'll be looking for the best seller by Vivienne within a year or so! Sept always felt like the new year to me when the kids went back to school. "Savored the silence" a lot! Enjoy your time. You have some very worthy goals. Good luck with your goals. I read somewhere (can't remember where) recently that it's better to keep quiet about goals. It said you were less likely to complete them if you made them public. I think that is rubbish! I'm much more likely to complete something if I've told others I would. Anyway, enjoy the school year! I need to make that my goal - to have a mss done by end of school year. As for NaNoWriMo, it intimidates me. 50k words in a month? And in a month that contains a major week-off-from-school holiday here, as well? Not sure it can happen. I'll decide when I get closer to the date. I think it's great you have goals. I guess my new goal for September is to write more. I haven't written anything in over six months. This is not a great way to get published :-S Good luck with yours, I'm sure you can do it ;-) I have faith! Good Luck with your well thought out goals. Since my kids are gone, nothing has changed for me, but I would like to stay out of my "funks" (feel like I'm in one now). I should be enjoying this time when I am not working, and need to start! That is quite a list of ambitions. You will definitely be busy! I think you'll really enjoy Holly's Inbox. I love your goals, but won't be shouting at you if you don't complete them. I am all too aware of how "general life" can interfere with our plans sometimes! Your book finds look great and now I am really thinking I need to get a copy of The Hunger Games--I have read nothing but great reviews. Holly's Inbox looks fun too. Regarding the comments you made on my blog about the plums I canned--They are canned in a syrup of sugar and water! That is it. There are recipes for extra light, light, medium and heavy. The canning is super easy, just time consuming. Each batch of jars, consisting of 6 or 7 jars took 25 minutes to process in the canner. I think you can keep them for up to 2 years---but I don't like to take a risk. I know they are good for sure up to a year--with they way we go through food in this house with my 2 teenage boys I am pretty sure they will be gone by next Fall! I loved Holly's Inbox! Enjoy your books. Those are ambitious plans! Good luck with all of them, especially the manuscript one. I should be making similar goals myself (like to cook with more variety). I hadn't seen that cover for The Hunger Games before. It's always fun to see the different international covers. Kaye - don't look too soon. I have to write it first.LOL. Kristy - like to put it out there. So fellow bloggers can nag me. Amanda - we will have to urge each other on. I am undecided about NaNoWriMo yet too. Ceri - I will moan at you to write, if you moan at me back. Diane - I have similar 'funks', last year I wasted a lot time and I am determined not to do the same this year. Bermudaonion - I am really looking forward to Holly's Inbox. I think it will be a lighter read for me. Mommablogsalot - Thanks Jen. It will get easier for you, as your beautiful little girls grows. Be warned - they get to a certain age and start answering back. Kim - thank you so much for replying about the plums. I am wondering what I can can now. Yvonne - I can't wait to read it. Alyce - it is nice to see different covers. I often prefer the American ones to the UK ones though. Great goals for the school year! I don't have kids but I might borrow some of your goals and challenge myself to accomplish them by June! lol I'd like to cook more, be more creative especially in terms of re-decorating and be more organized. The writing, well, I love the idea but although I write for myself, a manuscript is a tall order I will leave to you & wish you much luck with it! You have some great new books! I loved Mark Haddon's "A Spot of Bother"! "Holly's Inbox" sounds like a lot of fun & I think Joan Aiken is a great writer. Congratulations on Best Intentions, it looks very interesting! Happy Reading, Viv! Oh! It's fine to savor the silence and be glad to have some time to yourself. I think most moms do - understandably! Good luck with your goals, Vivienne. Do keep us posted on how the writing is going! And enjoy all your new books! I am wishing you nothing but the best w/ your goals, my friend. I know you can do it! Go, Viv: )! As for "Organization" oh, i love my mess -- it is done to perfection by Diane. LOL. I am really looking forward to you baking me cookies & mailing them to me. Haha! As for the manuscript, Viv, I know you will complete this goal -- move over JK there is a new literary Princess in town. Whooo~Hooo! Keep ypur eyes posted for an email from me encouraging you -- stalking you 4 the chocolate chips ;p.
As for the Scrapping Queen -- I'd love to buy a card or to :]. I think I will read The Hunger Games sooner than I planned. I want to see what a the buzz is about. You got some goodies, Viv, enjoy. Hope you realise your goals. And you got wonderful books! Amy - come join me in my goals. The more of us that set our goals, the more of us to nag each other. Avisannschild - thank you and i will try and keep people posted. Debi - I really wouldn't call me a writer. More of a lazy bugger who needs to get off her backsided and finally achieve something now I am not teaching.LOL. TheBookResort - you wouldn't want my previous attempts sent in the post. The last cakes I made were rock hard. I shall improve in everything I do. I hope anyway. You must read The Hunger Games. Guatami Tripathy - Thank you. So neat to read about your goals. I am with you on the cooking and being organized part. 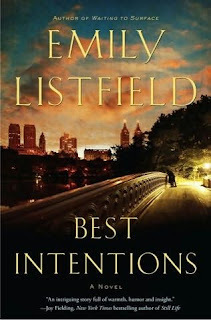 Happy reading, I loved Best Intentions. And savor that silence! I'm jealous...lol...not 5 minutes ago I had to yell out 'be quiet already! lol! good luck with your goals, you can do it! Good luck with your goals, Viv! I like the pile of books that you've got got your MM! Great books as always, but wow. Those are some serious goals. Sounds pretty stressful, if I'm honest. All that pressure. But good luck, I know you can do it!